To a dismal atmosphere, came out the two sides who were both in poor form and desperately needed all three points. Spurs' attacking force exposed Villa's shambolic defending in a situation which saw Eriksen guide his effort towards a lurking Chadli in the box, who reacted late then allowing Roberto Soldado the chance to head home but the Spaniard miserably put the attempt wayward of Guzan's post. At the other end, Benteke was gifted a wonderful opportunity to score Villa's first goal in seven weeks. The Belgian latched onto a magnificent looping delivery from Lowton but was unable to direct his headed effort past Lloris, and the chance went begging. Villa Park suddenly erupted on the 15 minute mark. Charles N'Zogbia's pulled back stroke fell to Andy Weimann who made absolutely no mistake in taking full advantage of the opportunity. 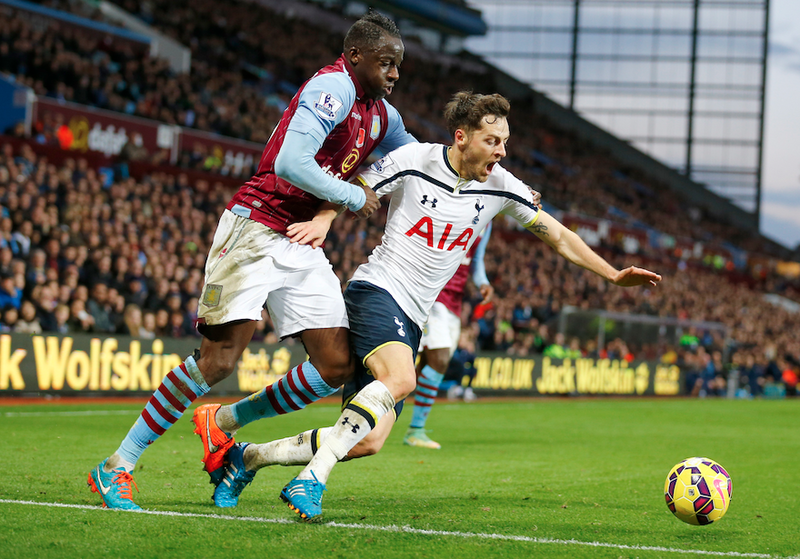 He took the ball into his stride and confidently slotted home past Hugo Lloris to re-store hope inside Villa Park. Atrocious piece of defending form the visitors. When goalscorer Weimann retrieved the ball, Kaboul turned his back and spun in an anti-clockwise position from where the ball was directing at. Pochettino surely frustrated at his team's defending here. Cissokho made a blistering run down the left flank, then pulled it back to Benteke, who was completely unmarked in the box but the Belgian-born striker fired his rocket shot off the frame of the post and out. Half an hour into the game, Tottenham looked lost. Everytime Lambert's men whipped a ball in, the back line fretted with fear. Villa, on the other hand established what they've been missing for over a month. Attacking firepower that was, mind you, putting Spurs under severe pressure. Harry Kane replaced Emmanuel Adebayor just after half time in an attempt to draw Spurs level. Not long after the substitute, Villa found themselves a man down. After the replay footage saw Christian Benteke palming Ryan Mason's face away, so the referee silenced Villa Park and sent the Belgian back into the dressing room. Following the red card, Villa actually scorched forward with Weimann racing on the ball. He cut in from the right hand side but his shot was deflected wide. Surprisingly, for a goal kick. Andros Townsend came on for Spurs late on to provide width, and pace down the flanks in which he earned a corner from. From that set piece saw Nacer Chadli creep around the back post and slotted past Guzan to silence Villa Park and provisionally earn his side a point. Spurs, again put the hosts under more pressure and with a free kick, Harry Kane stood over. The youngster launched it at goal, and a deflection off Baker saw the ball swing straight past Guzan into the top corner to a vibrant roar from the away fans. That was that, and Harry Kane's late wonder strike denied Villa of any points to plunge Lambert's men into serious doubt. Nacer Chadli scored a late goal in the dying stages of a highly competitive match to deny Aston Villa of their first league win since September 14th.